Along with its reputation as a popular tourist destination, St.Tropez has become known for its cuisine, which is a fusion of Mediterranean and French flavors. The St.Tropez Diet plan incorporates the delicious tasting food combinations of the region and makes use of the health and weight loss benefits of this dietary approach. The foundation of the diet are foods such as fish, olive oil, fruits, vegetables and whole grains which is similar to other Mediterranean diet plans. The plan is concentrated on fresh wholesome foods that contain a high ratio of omega 3 fats and the right balance between omega 3 and omega 6 fats is emphasized. Dieters are advised that in order to increase the fat burning benefits of omega 3 fats it is necessary to consume them with foods that are high in vitamin A such as carrots, pumpkins, red peppers, papaya and mangoes. Increase the intake of foods high in omega 3 fats such as salmon, sardines, flaxseed oil and walnuts. Always try to eat foods high in vitamin A in the same meal as the omega 3 fats. Restrict foods that have a high content of omega 6 fats, which includes most processed foods such as cookies, crackers, baked goods and mayonnaise. Eat a wide selection of fruit and vegetables. The focus for this phase is on replacing saturated fats in the diet with omega 3 fats. This phase is followed for the first week and provides 1600 calories. In this phase, which is followed during the second week, the caloric intake of the diet is reduced to 1450 calories per day. Dieters are encouraged to commence a structured exercise program in this week. This phase is followed for weeks 3 through 6 where the calories are reduced even further to around 1300 per day while exercise is increased. If dieters feel they would like to continue to lose weight at the end of the 6 weeks they may continue on this phase of the diet for a few more weeks. This phase is followed for weeks 7 and 8 and involves increasing the caloric intake to around 1500 calories per day. This is achieved primarily by boosting the intake of omega 3 fats. Dieters also learn how to combine these fats with foods high in vitamin A so as to maximize fat burning for long-term results. Find more Mediterranean and French inspired recipes here. Exercise is an important component of The St. Tropez Diet and for dieters who are not physically active walking is recommended as a way to initiate a structured exercise program. As fitness improves a broad range of exercises should be incorporated that will include cardiovascular, muscle resistance and flexibility exercise for a well-balanced program. 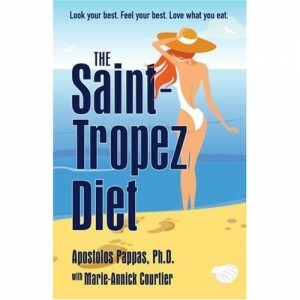 The St. Tropez Diet retails for $25.95. It may be necessary to spend a little more on the weekly grocery bill due to the higher intake of fresh fruits, vegetables and seafood. Not overly restrictive and allows for moderate intake of coffee, chocolate and wine. Includes a wide variety of wholesome foods and a high intake of fruit and vegetables. Reduces risk of chronic illness such as diabetes and heart disease. No calorie counting or measuring. Includes delicious recipes created by a French chef. Recommended calorie intakes may be too low for some dieters especially those who are very physically active. As the St. Tropez diet emphasizes the importance of eating for pleasure it may be especially appropriate for dieters who do not want to completely give up their little indulgences such as wine and chocolate but still would like to improve their diets and lose weight. Even through the menu plans provided may be too low in calories for some dieters the plan does provide for flexibility and may easily be modified to suit the requirements of the individual. Overall, The St. Tropez Diet is a very balanced lifestyle weight loss plan that should establish healthy habits and will allow for weight loss to be maintained over the long term.